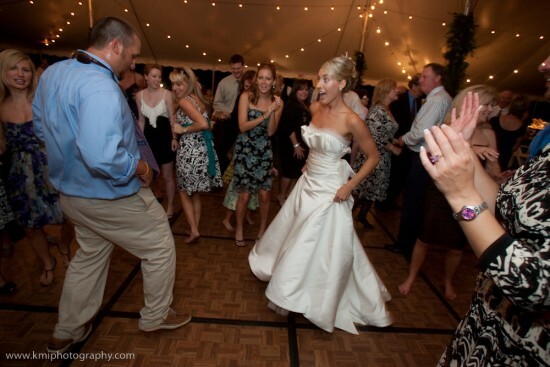 An "AWESOME" wedding, party, and dance band. 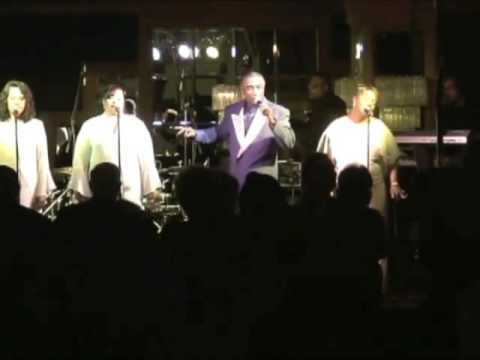 With music designed for your event, these professional musicians perform current Top 40, Motown, R&B, Soul, 70's/80's Disco, Carolina Beach, Jazz and Big Band for all ages. As SPECIALIST in wedding receptions, corporate and private events, reunions, festivals and outdoor concerts, this MAGNIFICENT BAND travels with a full production of sound and lights, and a DJ upon request. You have the option of selecting the type of music you want to be performed, so your event will be remembered FOREVER. Call now and reserve this band for your "special" day. It's time to call. Call NOW! CALL Now!! CALL NOW!!!! We celebrated our 25th Wedding Anniversary on August 10th at our home on the Lake and my Husband hired Johnny White and The Elite Band to perform as a Anniversary present to me! We have heard them perform over the years but this time they outdid themselves (if that's possible). They came early and were prepared, dressed to impressed and did not disappoint. Mr. White is a soft spoken gentleman but a very powerful band leader and singer. We received so many compliments....just amazing! We loved your performance! Thanks for making our dreams a reality. We hope to have you back again soon. Johnny and his band were a great hit at the car show. Most car shows do not have a live band, but we did. Weddings are definitely NOT the only thing they do. The crowd was pleased and well entertained. I certainly hope we can have them back next year. I recommended Johnny White and The Elite Band to several of my friends who are having weddings and anniversary celebrations. All my guest were amazed at their performance and sound. They entertainedmy guest way beyond their expectation. They were just amazing.!!! This band is awesome!! The band, singers, dance moves, and the lights, all had my small audience on the dance floor! Out of about 60 attendees, 50 of us were on the dance floor! They sound great!! This band is great for any type of event! They are very professional from the beginning to the end! I can not wait to have them again! Johnny White and The Elite Band performed our corporate Christmas party. Not only was the band exciting, but there choice of music for our diverse employees was excellent. The band was high energy, the ladies were very elegant and it was a none stop party. I was quit impress with how early the band arrived to prepare, making sure that their music would not be too loud and they were totally organized before our guest arrived. I would highly recommend this band to anyone having a corporate event. I booked Johnny White and his Elite Band for our family reunion. To say that they put on a "stellar" performance is an understatement. What impressed me the most was that they came in early to set up their equipment, check their sound and were out of our way when the majority of my family members arrived. Not only did they play music for our adults, but they played music that our younger children recognized and danced too as well. I can tell you this, Johnny White and The Elite Band put on a show that all my family, both young and old, are still talking about. I highly recommend this fabulous group to anyone who wants to have a "real" party. Excellent Band! Nothing else to say but Excellent! I have seen this band so many times over the years and I've never been disappointed. I could honestly write many reviews. I currently live in Fayetteville, N.C. and I travel to see this band whenever they are near. I have even traveled to other states when they have performed. That should say it all! I love the reaction and comments of the crowd whenever they play. I have even run into people that I've seen at their shows before and they are always excited to see them perform! Excellent band! I will continue to go and see them whenever I can! finest voices I've ever heard. It's been a while but I have heard Johnny and his band on many occasions over the years. I have never been disappointed with the show he delivers! It's fun, engaging and always on point. Professionalism on every hand including early setup, dressed to the max, music and choreography delightful and you will not see him or his band members performing intoxicated. If you want real music and real musicians, I recommend Johnny White & The Elite Band! Johnny White & The Elite Band were absolutely wonderful at my daughters graduation party. Their music was tailored for everyone from the children to the older adults. They were exciting to hear and watch, and I would highly recommend them to anyone who wants to have a "real" party. We hit the Jackpot with Mr. White and his band !!!!!! Mr. Johnny White and The Elite Band are the consummate professionals!!! They provided the entertainment for our family reunion banquet on Saturday night. I was more than pleased with their performance because as chairperson of the entertainment committee, it was up to me to provide my family with quality entertainment. If there is a more suitable word than quality, please inject it here because that is what Mr. White and his band provided for us. It was a pleasure to negotiate with him. We had a limited budget but he amicably worked with us. During the course of the evening, if a family member requested a particular song that wasn't on their list for the evening, they performed it without a problem. What impressed us the most was that Mr. White and the band were enjoying themselves while they were performing. You can really tell that they LOVE what they do and are totally committed to putting on a quality show. That speaks volumes to me about Mr. White's leadership. They looked terrific, they sounded terrific . . . I don't know what more I can say about them except they are GREAT !!! I'd recommend them to anyone who's looking for a band that will give them some great entertainment. Johnny White & The Elite Band A Class Act! 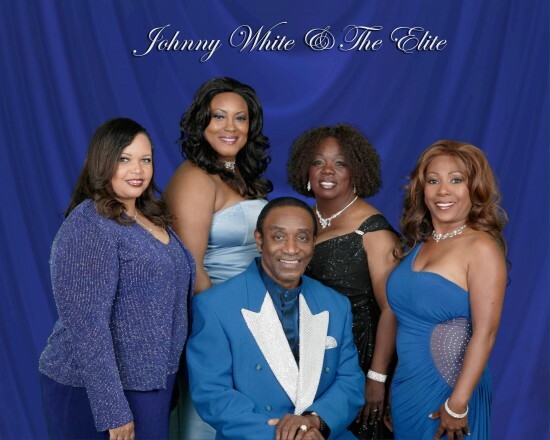 I only recommend the very best and Johnny White & The Elite Band have my total endorsement as a Polished Professional group of quality entertainers. They deliver every time! The combination of singing and high energy choreography allows the spectator to become a part of the show. Considered by many as one of the most exciting show/dance bands in the music business. Specialist in wedding receptions,corporate conventions,private parties, festivals, reunions, and any type affair that requires a 'first class' presentation. 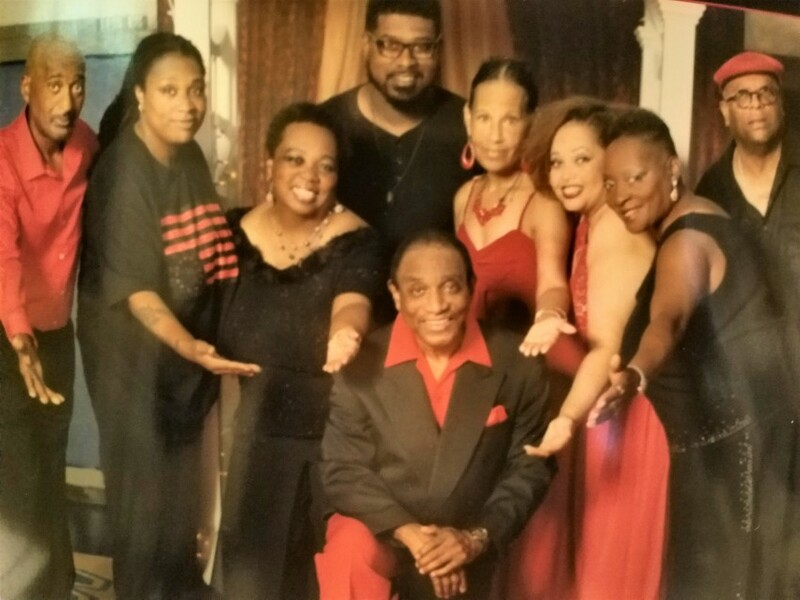 Serving as an opening act for many national artist over the years, the group consist of a male and female lead vocalist, three awesome female background singers, and a four or five piece backup band. Traveling as far away as Alaska, the group tours with a full production of sound and lights to any venue a client is willing to pay for musical services. Available with 7, 9, 0r 13 performers. 1.The building or hall must be unlocked and available, and staging in place no less than four (4) hours prior to the starting time of the engagement or designated set-up time specified on the contract. Failure to do so may result in a delay in the starting time of the performance. 2. Presenter to provide eight (8) separate 115 volt dedicated AC circuits on separate circuit breakers, of no less than 20 amps each, for the EXCLUSIVE use of the Artist. If this power arrangement is not available, the Artist travels with his own electrical distribution box, designed to plug into a NEMA 10-50R, 250 volt receptacle, with 50 amp over current protection. 3. Payment to be made in cash or check (certified, corporate, or school: NO PERSONAL CHECKS, please) payable to Johnny White or ShowTranz, Inc. Check the contract for any special payment instructions. 4. Presenter to provide two (2) private changing rooms to accommodate Artist comfortably. Rooms should be stocked at load-in with ice, cups, water, “not from concentrate” orange juice and soft drinks. The rooms should contain a mirror, table, clothes rack, and enough chairs to seat the band (see contract for number of performers). 5. Presenter to provide one (1) large skirted eight (8) foot heavy-duty table for the sound and light equipment and three chairs for the engineers. 6. To perform the maximum, Artist needs a stage at least twenty-four (24) feet wide, sixteen (16) feet deep, and one (1) to two (2) feet in height. A smaller stage will be considered, but the presenter should make an effort to insure as much staging area as possible. 7. For public engagements, radio, television, poster, newspaper, and marquee advertising should be employed at least two (2) weeks prior to the performance date. 8. Presenter to provide a hot meal for all band members and staff. 10. Presenter to provide full disclosure of any special rules or regulations regarding the venue. Earth, Wind, and Fire, James Brown, Gladys Knight, The O'Jays, Luther Vandross, Barry White, The Temptations and Aretha Franklin. I think the party on New Year’s Eve went very, very well. Both the members and staff thoroughly enjoyed your band. I appreciate your attention to detail and conscious efforts to make sure the sound was appropriate. I will look forward to another opportunity to work with you in the near future. You were absolutely fabulous at our wedding reception and really made the party. You are more than welcome to use me as a reference in the future. never retire until I leave the YW. moving it from a Thursday to a Friday. I am sorry I did not have a chance to talk with you after the dance - everything was just so hectic! You and your band were absolutely FABULOUS! I had so many people comment on how good the band was. I even have friends who have played in bands their entire lives and they were coming up to me giving me the thumbs up and asking "who got that band???? -- they are really great!!!!!" I can't even begin to tell you how much we enjoyed it. If you ever need a reference, you can surely use my name! Johnny White and the Elite Band are amazing! By far, the best investment we could have made for the wedding. They are exciting, professional, vocal, and easy to get along with. I live in a small town and you see the same people when someone gets married. Most of the time, people stand around in a corner bored. NOT WITH JOHNNY WHITE! The band was dynamic and played a great variety of music. People danced, danced, and danced some more. I have had so many wonderful compliments about Johnny White and I HIGHLY RECOMMEND this professional band to anyone looking for great entertainment. were. We really had a great time and the Johnny White Elite Band made it happen. Thank you. – Linda Gecha/Princeton Symphony Orch. Musical style was dynamic, was complimentary to the event...Superb! Thank You for the tremendous performance during our Holiday Party. Johnny White, Shirl, Allegro, and the Elite Band brought the music, energy, and sound that made the evening special. We've heard so many compliments from our employees this morning. Just a outstanding performance !!! A big Thank you to you and your band! You guys were perfect!!!!!!!! The senior club absolutely loved you. I have never seen them dance like they danced last night. You kept the program interesting enough for the younger crowd as well. You put on a fabulous show! Thank you also for putting up with me. I had no idea how to run things, my husband kept telling me “this is not the first dinner they have played at, they know what they are doing!” And you truly did! You were a hit with young and old!